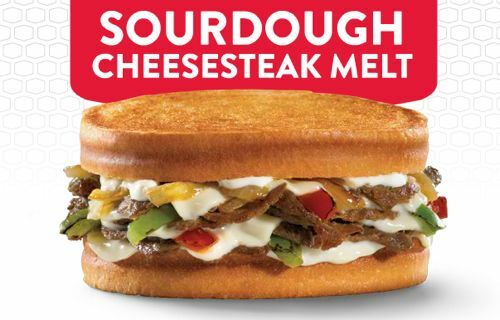 Jack in the Box has a new sandwich out called the Sourdough Cheesesteak Melt. I saw the commercial for it the other day and decided to try it and see what I thought. And so I did. Jack in the Box did have a Philly Cheesesteak sandwich in the late 1990s/early 2000s that was not bad, so it was interesting to see they were going this route again and that it was on sourdough. My guess is that not enough people are buying the Sourdough Jack so they’ve got to put sourdough bread to more use at the Box. While the sandwich tasted good,a couple things lacked. First, it wasn’t as cheesy as it should be. I like my cheesesteaks very very cheesy, the taste of cheese in my mouth has to linger for it to be good. Kind of like when my dad makes tacos, he makes them pretty damn good. I will always make it home for taco night. The second thing it lacked was a lot of grease. Cheesesteaks should be greasy. So greasy that it makes the paper it came in or on something you can see through. However,Jack in the Box may have done me a favor by not making it so greasy because my cholesterol has been known to be high in recent years. I think if you’re craving something a little different,this is worth a try. The Sourdough Cheesesteak Melt is valued at $4.49 for a limited time only. ← Do the Yankees need a younger future?